Oak Brook, Ill., May 20. Chanting “We work! We sweat! 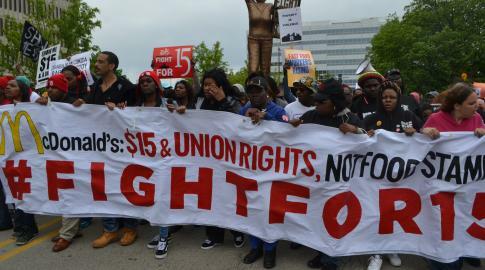 Put $15 in our check!” as they marched behind a banner reading “McDonald’s: $15 and union rights, not food stamps,” thousands of McDonald’s workers and their supporters marched on the fast food chain’s corporate headquarters in Oak Brook, Ill., on May 20. They carried a petition signed by 1.4 million people supporting their demands, which they delivered to a McDonald’s representative. A smaller demonstration took place the next day when McDonald’s had its annual meeting in Oak Brook, west of Chicago. Mary Kay Henry, president of the Service Employees International Union, which has financed many of the protests against McDonald’s, called on it to bargain and give its workers a bigger share of its profits. The NAACP also supported this protest. 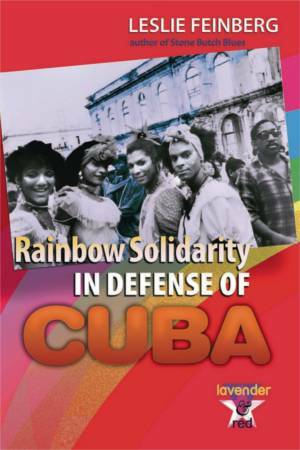 Many of the workers engaged in the struggle are Black. McDonald’s, whose financial gains are lagging, has a new CEO, Steve Easterbrook, who wants to reinvigorate the company. He has announced a dollar-an-hour raise over the minimum wage — which varies from locality to locality — as well as benefit increases for the 90,000 workers the company directly employs. But 80 percent of McDonald’s workers are employed by franchise owners, and they will not be getting this increase. The SEIU is pursuing a legal strategy before the National Labor Relations Board to get around this issue by declaring McDonald’s a “joint” employer with the franchisees. McDonald’s wanted to use its wage hike to present itself as a progressive burger company, but the two days of militant protests in Oak Brook exposed its pretenses.